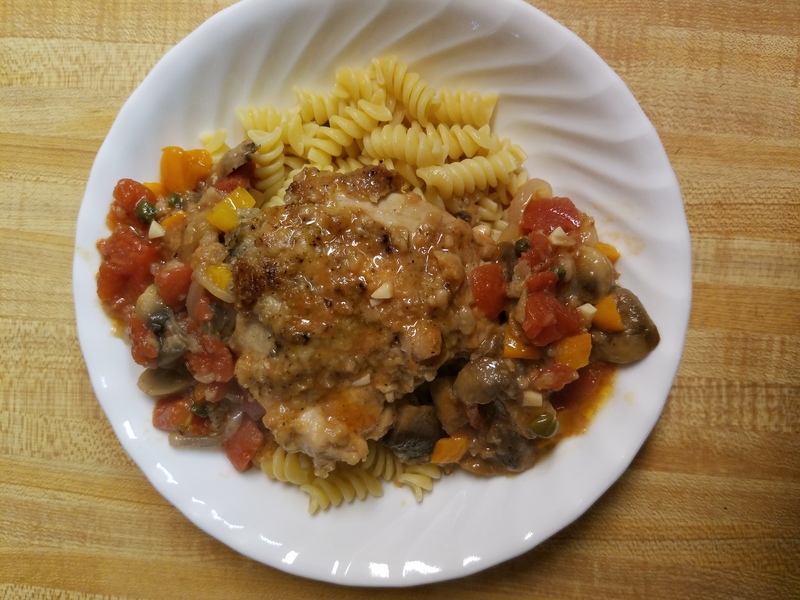 Just a great way to cook up some chicken, real easy and make a great dinner. Sprinkle the chicken thighs with 1 teaspoon of each salt and pepper. Dredge the chicken pieces in the flour to coat lightly. In a large heavy sauté pan, heat the oil over a medium-high flame. Add the chicken pieces to the pan and sauté just until brown, about 5 minutes per side. Transfer the chicken to a plate and set aside. Add the bell pepper, onion and garlic to the same pan and sauté over medium heat until the onion is tender, about 5 minutes. Bring the sauce to a simmer. Continue simmering over medium-low heat until the chicken is just cooked through, about 20 minutes for the thighs. You can serve this with rice or noodle. There is one thing that I just don’t understand with a lot of chicken dishes and that is the part of leaving the skin on the chicken. I fine that it always turns in to a mess and is not editable. The cappers add a lot to this dish so don’t skip them.